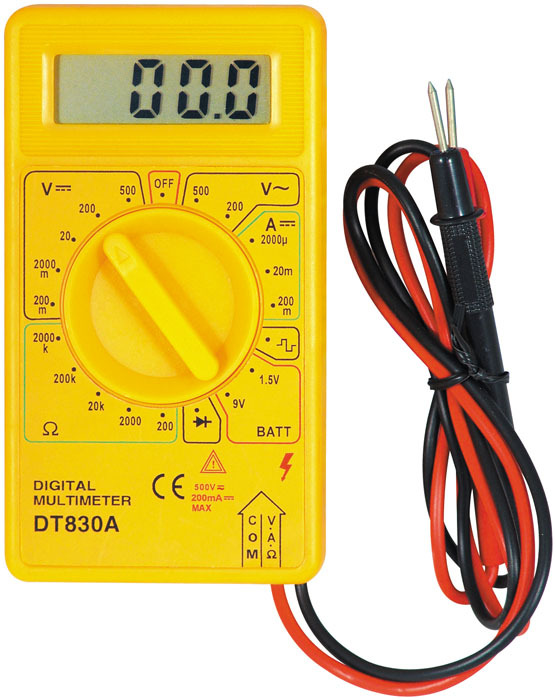 Multimeter is an essential electrical tool to measure voltage/current/resistance of electrical components and circuits. Before discussing the use of a Multimeter, let’s discuss its definition. In the early 1800’s, galvanometer was used to measure the resistance and voltage. Then in 1920’s Multimeter was invented by Donald Macadie, .to measure ampere, volt and ohm of an electronic component. Voltage, alternative and direct, in volts. Current in amperes, both alternating and direct. Temperature in Celcius and Fahrenheit degree. Selection Knob – it allows the user to set the multimeter to read either volt or ampere or ohm. COM – A probe is plugged in it to connect to the ground or circuit. Usually ithe probe is black in colour. mAVΩ – A probe is plugged in this port to measure current, voltage and resistance. Commonly the probe is red in colour. 10A – It is used to measure high currents.